This easy vegan strawberry cream puff pastry tart is a delicious dessert that needs only a few minutes to make. You can top it with any fruits and it’s also a perfect addition to breakfast or brunch. I came up with this recipe spontaneously after a quick food shopping trip. As I saw these beautiful and fresh red strawberries, I couldn’t resist and had to buy them. I mean, who could say no to these yummy fruits? 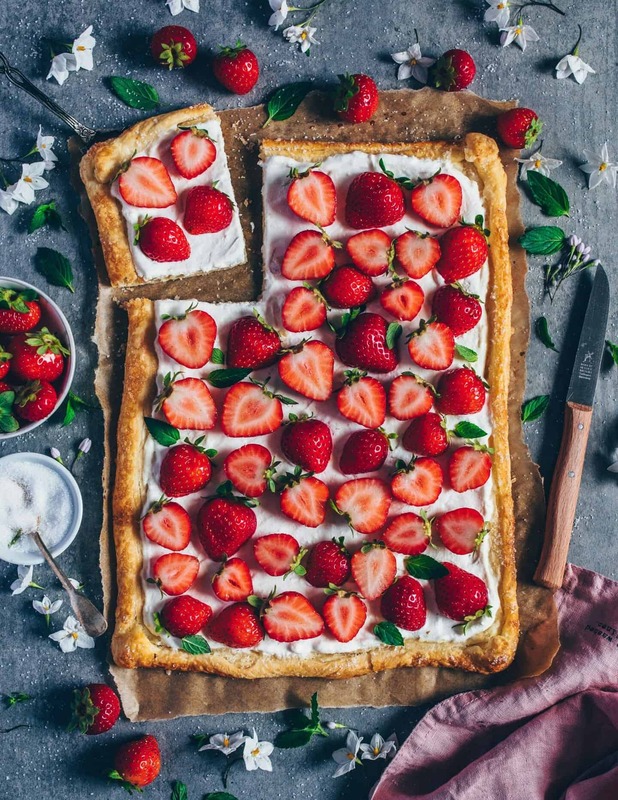 Actually, I wanted to make a delicious Vegan Strawberry Cake, but I had still a sheet of vegan puff pastry in the fridge. 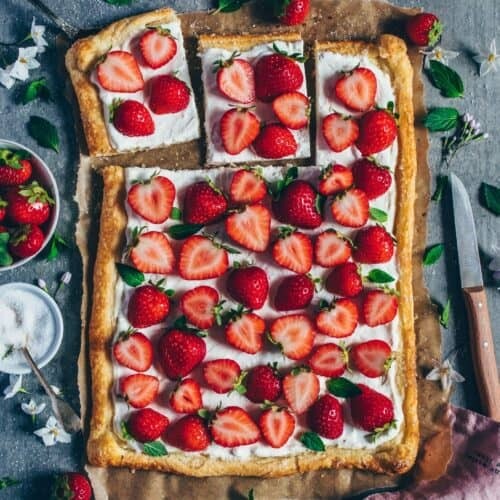 So I changed my mind and made a simple and quick vegan strawberry cream puff pastry tart. Sometimes I have a craving for puff pastry because I love this flaky, crisp and buttery taste! 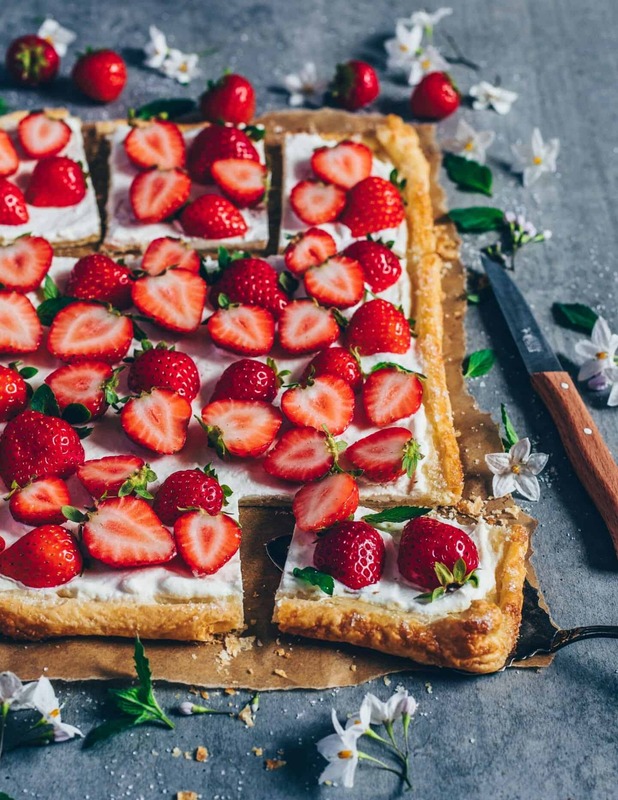 And did you know that most puff pastry which you can buy in the supermarket or organic store is even vegan? 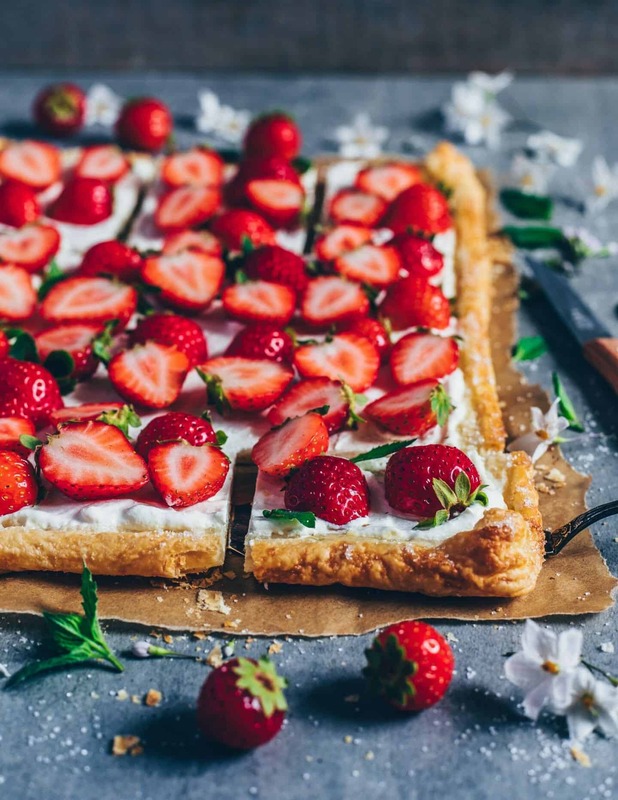 Actually, puff pastry is usually made of plant-based margarine or palm oil instead of dairy-based butter. To be sure, simply check the ingredient list stated on the package when buying. Another great bonus of using puff pastry is that you don’t have to make a dough. So it‘s just perfect when you don’t have much time because you can make it in a matter of minutes with minimal effort! If you prefer making your own crust, head over my gluten-free Vegan Key Lime Pie recipe. 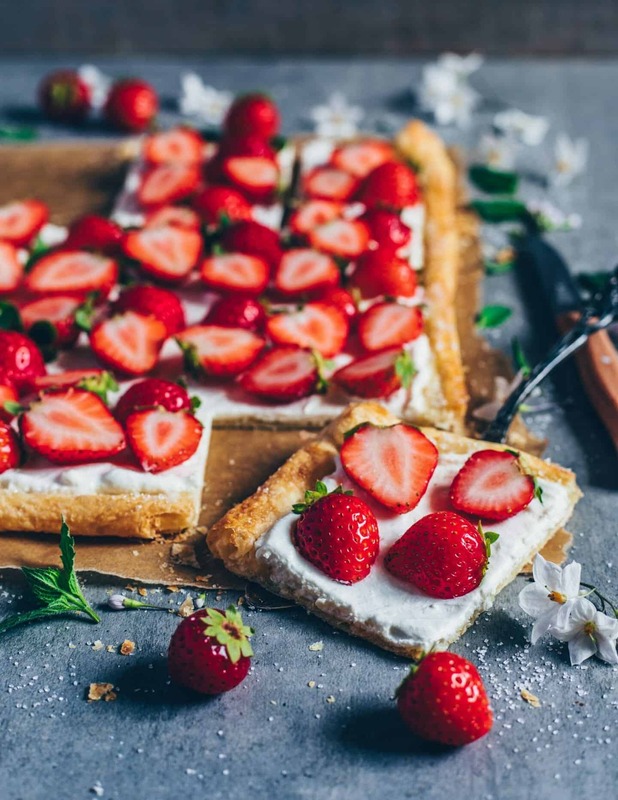 If strawberries are no longer in season where you live, you can, of course, use any other fruits based on the seasons or on your wish. For example peaches, plums, nectarines or cinnamon apples would be a great option. I‘ve made this tart already with blueberries and raspberries and it was also so delicious. But almost everthing goes well with puff pastry because it’s a very versatile ingredient. You could also use it to make a savory Pizza with Tomatoes and Vegan Mozzarella or with Spinach and Cashew Cream. Coconut cream is actually the solid part of chilled coconut milk. I like to keep a few cans in the fridge at all times so I don’t have to wait for it when craving coconut cream. To make it, chill a can of coconut milk in the fridge for at least 24 hours. After chilling, carefully open the can and scoop out the solid part into a cold bowl. Discard the coconut water and save it for another use, such as smoothies or simply drink pure. Then beat the cream by using an electric hand mixer until fluffy, smooth and creamy. Add in sweetener and vanilla to taste. That’s it! Best is to return whipped cream to the fridge until serving because it‘ll soften at room temperature. Otherwise you could also add cream stabilizer when whipping or simply re-whip if softened. 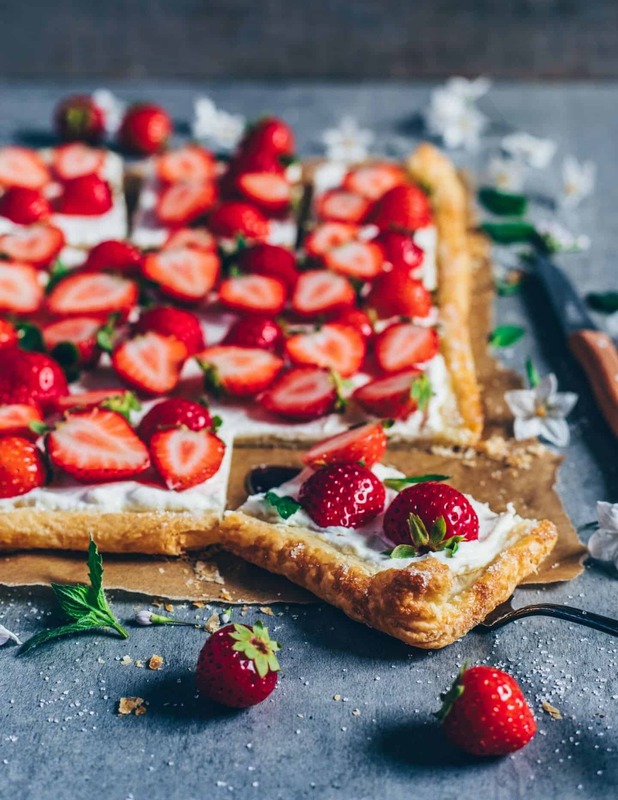 If you’re not such a big fan of coconut whipped cream, you could also top your puff pastry tart with plant-based yogurt or softened dairy-free cream cheese or vegan chocolate pudding. Roll out the puff pastry on a baking sheet lined with parchment paper. Then roll up the sides inward to create a border. Use a fork to prick holes all over the centre (except the border). 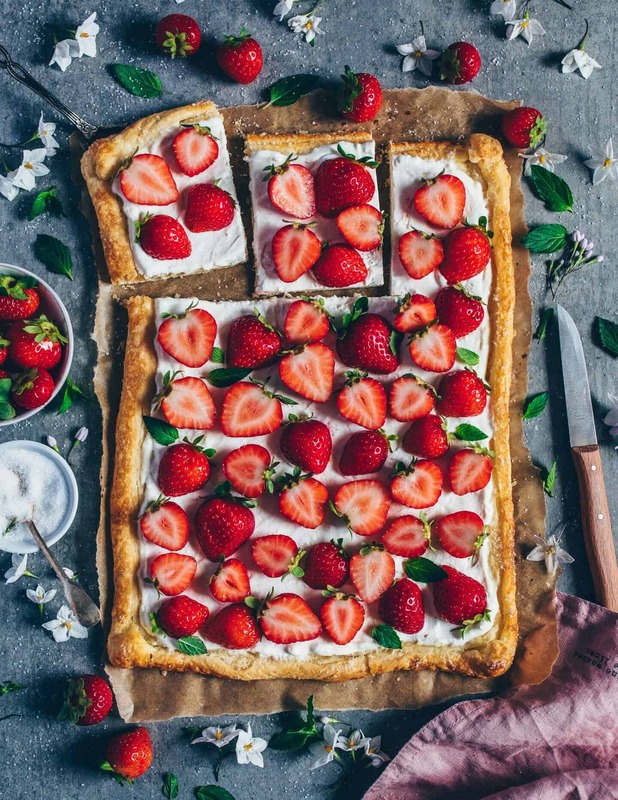 Brush the puff pastry with a bit of dairy-free milk and sprinkle over raw cane sugar. Bake for approx. 20-30 minutes, or until pastry puffs up lightly and turns golden brown. Transfer to a wire rack and let it cool completely. Chill a can of coconut milk in the fridge for at least 24 hours. After chilling, carefully open the can (without shaking!) and scoop the solid cream part into a cold bowl. Use an electric hand mixer and whip the cream until smooth and fluffy. Add in vanilla and agave syrup (or other sweetener) to taste. Store whipped coconut cream in the fridge until serving or use immediately. Gently spread the coconut cream over the centre of your cooled tart. 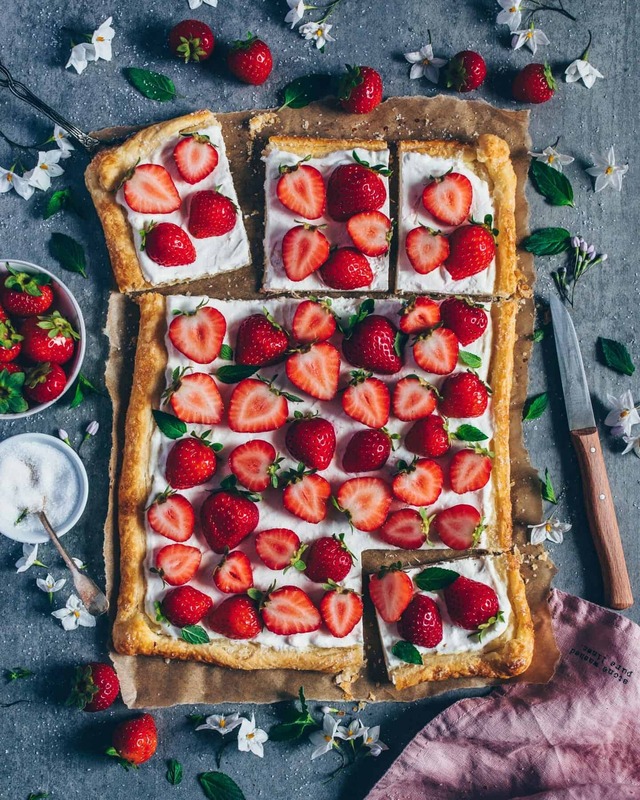 Top with sliced strawberries (or any other fruits you like). If using frozen puff-pastry, thaw at room temperature or according to the package directions. You can also use gluten-free puff pastry, if desired. Of course, you can use any fruits based on the seasons or on your wish instead (read the text above for suggestions). 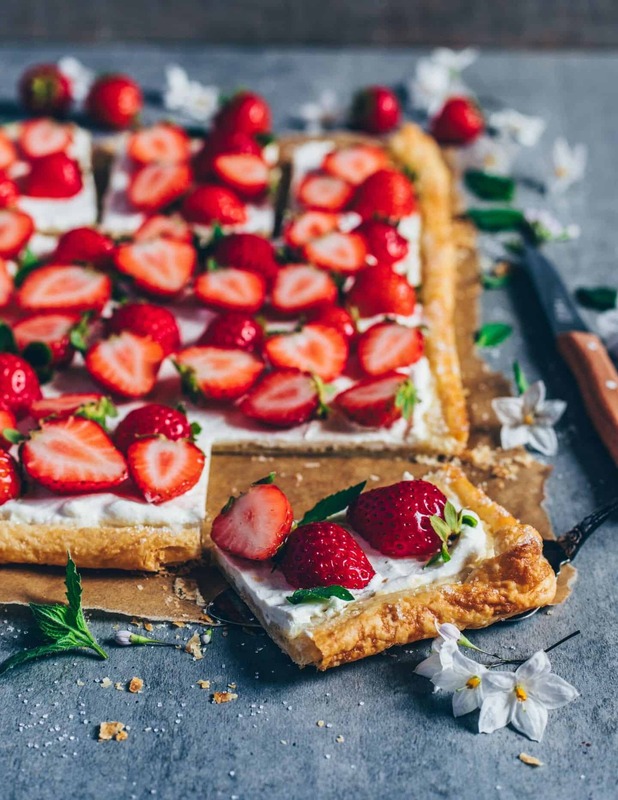 Instead of whipped coconut cream, you could also top your tart with plant-based yogurt or softened dairy-free cream cheese or vegan chocolate mousse. 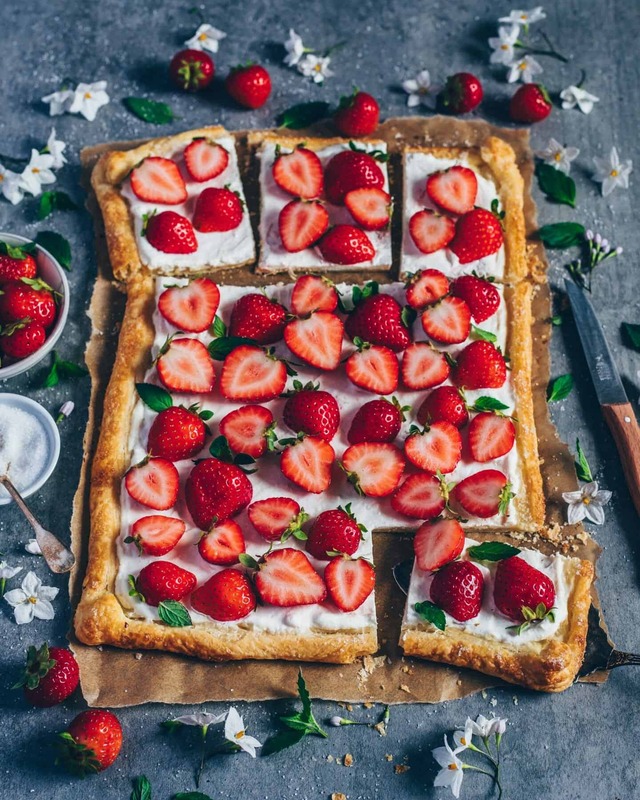 This strawberry puff pastry tart looks so amazing, Bianca! And I love how easy your recipe is.